Trussbilt's acoustical metal detention and security ceilings include SecureDek, BarrierDek and TrussDek, providing acoustical dampening and security solutions for minimum, medium, and maximum security applications. Trussbilt's acoustical metal security ceiling systems meet the full range of security ceiling requirements, from supervised areas of minimum and medium security facilities through in-cell use in maximum security detention applications.They also address the growing need to control noise in the detention setting, which creates not only a poor living environment for inmates, but also a stressful and unsafe working environment for correctional peace officers working in the detention facility. In addition to absorbing sound, Trussbilt security ceilings conceal and protect plumbing, electrical and HVAC facilities. Trussbilt security ceilings' unique snap-in secure lock system means they are twice as fast to install as screwed-in metal ceilings, lowering construction costs. Because Trussbilt detention ceilings are all steel, maintenance and replacement costs are dramatically reduced over the life of the building. Their life cycle costs are the lowest in the industry for detention ceiling systems and other security ceiling applications. Trussbilt manufactures all ceiling access panels to ensure seamless integration with other trades. And, Trussbilt's security ceiling systems can be used with our unique TrussWall product for a single source, integrated security package that allows you to realize even more savings on your project, both at time of construction and over the life cycle of the facility. SecureDek is a low maintenance acoustical security ceiling system for supervised minimum and medium security areas in detention facilities. It is composed of 18 gauge galvanized perforated steel panels, 2' x 2' or 2' x 4'. Its panels securely snap into a heavy-duty steel grid with vertical steel compression struts, cutting installation time. Panels are filled with a poly-wrapped fiberglass acoustical blanket to provide high sound absorption values. SecureDek specifications and test results are available as pdf files. Click here to go to our Resources page. 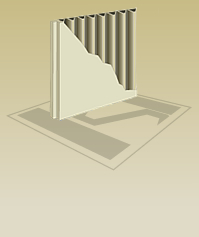 BarrierDek provides an effective security barrier combined with excellent acoustics. The interlocking, single layer panels provide great resistance to passage or attack in applications such as lobbies and corridors, detention dayroom ceilings, holding areas, inmate cells, hospital secure areas, museums, pharmacies, gymnasiums, and burglar-vulnerable areas. The factory-finished, powder-coated panels are constructed of (A40) galvannealed steel; the panels slip into place and are interlocked together, supported by perimeter and “T” angles. No supplemental screw fastening is required, speeding installation time. BarrierDek specifications and test results are available as pdf files. Click here to go to our Resources page. TrussDek, a metal plank ceiling system that provides a maximum security barrier combined with excellent acoustics, is the most secure ceiling system available today for detention facilities or any high security application. Double-layer panels combined with a TrussCore center provide superior resistance to passage or attack in applications such as inmate cells, holding areas, detention dayroom ceilings, security corridors, soffit enclosures, and wall separators. The prime-coated panels slip into place and are welded together to provide a secure environment. The shiplap design makes installation quick and easy while preventing the concealment of contraband. The all-steel construction allows placement of accessories and utilities where they are needed, eliminating the need to frame around penetrations. They are supported by perimeter and “T” angles. The complete brochure on all three Trussbilt ceiling products is available as a pdf file, as are specifications, test results and CAD drawings. Click here to go to our Resources page. Trussbilt’s SecureDek®, BarrierDek®, and TrussDek® lines require expert advice and installation based upon the particular characteristics of your facility. Our consultants and sales specialists will calculate quantities and prices based upon the particular needs of your project. Please contact our sales and technical specialists at 1-651-633-6100 for ordering information. You may also contact Brad Schotzko, VP of Sales and Engineering, at 651.633.6100, or bschotzko@trussbilt.com.